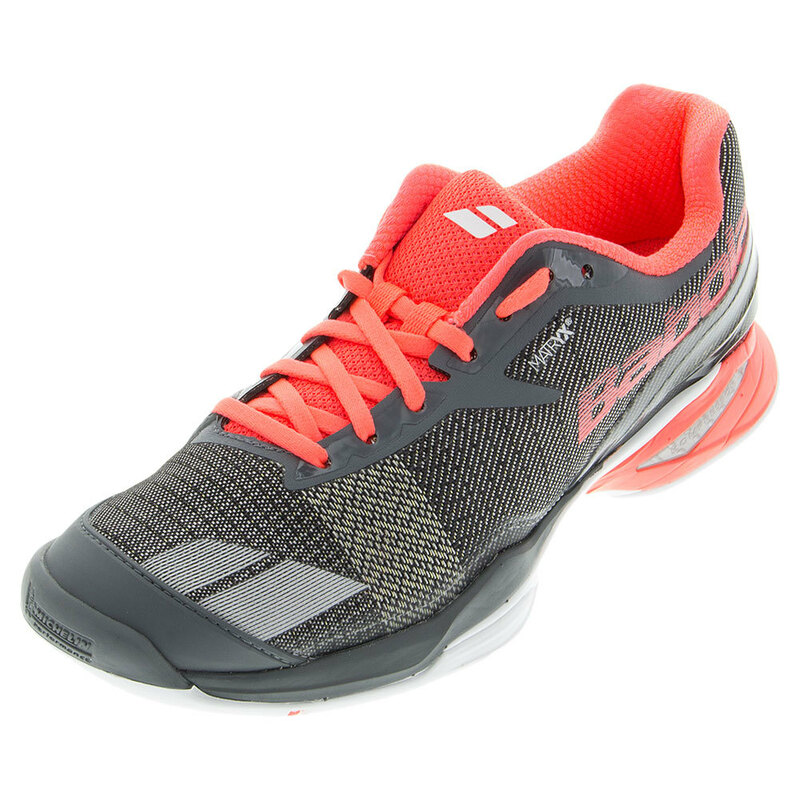 Babolat’s Jet All Court Tennis Shoes are a complete departure from the usual court shoe put out by Babolat. Don’t get me wrong: I love Babolat. I love the rackets, the string, the grips…but the tennis shoes? Not usually. Well, I have seen the light and will not ever count out another pair of Babolat shoes! First let’s just all say what we’re thinking, “These shoes look better than a shirtless picture of Rafa!” Well almost, anyway! The knit gray is a smart update that makes these look fashionable, but the bright pink color lets me know it’s an athletic shoe built to impress. They’re going to match virtually any summer tennis clothes I’ll wear this year, which is a big plus. If you’ve been out to league play recently, you know each team looks like a color in a pack of highlighters. So, this shoe is going to fit right in with my team’s color scheme. Past Babolat models have left me feeling the shock and awe of my own aggressive court movement during and after play, but the company has upped its comfort game with this model. Sometimes, I couldn’t wait to switch to flip flops or running shoes after my match, but I didn’t feel that way with the new Jet All Courts. I felt a thick bed of cushion all the way from the middle of my foot to the heel. I was in no rush to switch shoes after my matches and even had to remind myself to change out of them before moving on to the rest of my day! I’m no lightweight player, but I do like a lightweight shoe. Babolat answers this challenge with the Jet All Court. It’s the lightest shoe the company has ever produced, which allows me to intimidate opponents when I charge the net or show off my footwork to get into position for that overhead smash. They will never guess that I am secretly whispering, “I love my overhead, I love my overhead” to myself as I put the ball away. These shoes exude court confidence, even when I’m not feeling it on the inside! Another issue I always worry about is durability. I’m an awful toe dragger, especially when serving, but the Michelin outsole on these shoes ensures they will hold up under the pressure of serious match play. If I trust Michelin enough to put their tires on my car, they’re more than welcome to keep my feet happy, too! These shoes will be able to keep going, even when I’m ready to throw in the towel and head to the bar. Speaking of the bar, I wore these shoes at a clay tournament in Louisiana a few weeks ago and the tread performed beautifully! I’ve had great traction with these shoes on hardcourt and clay. If you’re looking for shoes that will help you stay quick on your feet, then the Babolat Jet All Court Tennis Shoe is the perfect choice for you! If you’re having a hard time making a choice, read our blog “Love Means Nothing in Tennis, Unless We’re Talking About Shoes” to hear more about this summer’s best shoe choices! ← Hey Guys! Step Into The Right Shoe for You!